Climate Craziness of the Week: how 'climate change is messing up' the search for the missing Malaysian airliner | Watts Up With That? March 24, 2014 in Climate Craziness of the Week. Maybe the maniac who flew the aircraft to about the most remote region it could reach made it harder to find MH370? No, that’s preposterous, it must me global warming. Sigh. Un-named “scientists”…because even the loopy folks that are out there would DISOWN THEM! But “Mother Jones” qualifies as “Left of the LEFT!”, and thus paying attention to them is not warrented. Idiots (unless they are being facetious, in which case it is very funny). The Mother_F2#$%%%s at ‘Mother’ Jones cannot be mocked relentlessly enough! Nor can their readers. After the black boxes are recovered and the analysis is complete, all the loons of the past couple weeks will be foaming at something else … they always find something to foam at. Bet you anything the “debris” they’re seeing are just chunks of ice broken away from icebergs. I can’t help but think the planes computers were hacked from the ground..
Everything that they know happened…happened exactly like it would happen if they were hacked. While the internet is filled with crank conspiracies, it is telling that even liberals tend to shy away from MJ as a source for any reliable arguments. This story is a prime example of why. went into the ocean, how does knowledge of the currents do you any good? And if you know how the currents have changed (which you claim) then why can’t you use this knowledge to know where to look, should you happen to know where to start? And why would anyone think it of significance that once every 50 years, when a plane goes down in this area of the world, we could locate the wreckage a few days sooner? Mother Jones is one stupid mother. The left is insanely desperate. They throw everything against a wall and hope something sticks for a day or two. There probably isn’t a more difficult area on the planet to search for a plane crash than this most inaccessible part of the roaring 40s. To make it worse, it has the highest average wave height in the world. Mother Jones shouldn’t need any stupid climate speculation to explain why it is a difficult place to search. As the airliner is now designated officially ‘lost’, one can only feel for the poor souls aboard and (assuming it was downed soon after contact lost) all the relatives subsequently living in hope. I have to presume there will be some ongoing official search attempt, simply because the airline industry (and governments) can ill-afford mystery losses. However, the daily ‘spotted… being chased… oh, it’s nothing’ hunt for ‘Where’s Flotsam?’ was getting downright silly, if keeping the world’s media in ‘nothing to report’ headlines daily. With luck this will now cease or at least ease. However, this was one bandwagon really not worth jumping upon, especially in the way MJ opted to try. The alien abduccion theory sounds more realistic. iI told you in the comments on the CNN Blackhole-Malaysia Airline story. The AGW propaganda with somehow claim any and all bad things are somehow caused by global warming. This question may be sligthly off topic, but I hope you can allow it: Latitude, you wrote that oxygen masks of the Malaysian plane were reconfigured. What is the source/ link for this piece of information? One word for the people that peddle this rubbish – BONEHEADS. That’s not the worst of it though, they are DANGEROUS VIRAL Boneheads – gradually infecting they less boneheaded people and consequently fuse their boneheads closer to their own. I guess it could be a bit like the Borg – a collective of sheer boneheads gradually amassing together……….scary! I think climate change is making warmist alarmists stupid. Perhaps a study can be done on this aspect – as long as CO2 is mentioned in the study, it will get a government grant for sure. Missing plane and missing heat to be found in the deep ocean.The most inaccessible part on Earth. You wonder why. The folks at MJ must not have realized that Courtney Love has already found the plane. I can just hear Chrissy Matthews form MSLSD in the near future say….”I’m so glad this plane went missing”. Ignorance on parade. Let these people make fools of themselves for in doing so, they destroy themselves along with the lies they spew. Pure press manipulation. A few innocent comments from oceanographers about current and pass ocean patterns. Mixed in with a bit of nonsense from a climatologist. And seasoned with a conclusion by a full on Warmist equals the most unlikely conclusion driven story of the year. We have not topped the kidney stone increase (http://www.sciencedaily.com/releases/2008/05/080515072740.htm ), but we are trying. The next headline will be that the crash was CAUSED by CC. I just read that “climate change will increase kidney stones” article. You are quite right. Nothing, absolutely NO THING will top that one. Could this be the first real sighting of the “Kunning-Druger” effect? I don’t think that the folks at Mother Jones need to take stupid pills. They started out that way. In the sixties Mother was a very nice little journal full of usefull things…..or was it me who changed. Where do they get these “climatologists” who have certain knowledge of deep ocean currents based on surface winds and a “warming world ” that isn’t warming? Latitude: thank you for your explanation. The hacking theory seems far-fetched, but it’s not impossible, especially since at the moment there is no plausible explanation for the mysterious disappearance of the plane. Is it only me who finds this mildly offensive? Inventing “scientific” reasons to use the loss of an aircraft and (presumably by now) everyone on board as a point-scoring exercise is, imho, beyond stupidity and edging out the wrong side of tacky. It would be nice if at least some of Mother Jones’ readership understood that but I won’t hold my breath. I’d call it a stretch to think that MJ was ever useful, except as a propaganda rag. Maybe you are thinking of The Mother Earth News, since Mother Jones magazine was first published in the mid- 70s. Twil/Latitude: I can see no reason for allowing the update of flight equipment from the ground. It gives a massive and therefore unacceptable risk to flight safety. Can you provide links to evidence of this? I’ll say it again: the left is making it very difficult for the fine folks at The Onion to earn a living. It’s simply impossible to parody this level of stupidity. 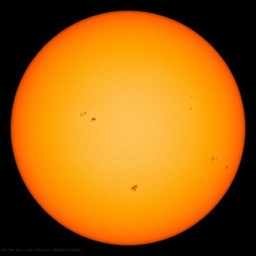 This used to be called “clutching at straws” before the warmists went mad! There was no maniac. My feeling is that the pilots – correctly – pointed the plane away from flight lanes due to an onboard fire. All on board were long dead before the plane ran out of fuel and ditched. There’s has been some mention of their onboard systems/computers not being secure (enough)…way before this happened. I’ve been reading it since the plane came out, have no idea where a link is now. Mother Jones is a sensationalistic ho. Good luck proving that currents are “messed up” you idiots. Oh, and while you’re looking, please look for the missing heat. I’m pretty damn sure you’ll find exactly what you look for, because that’s what you climate catastrophe alarmists usually do. On a more serious note, do 777s use oxygen tanks or do they somehow concentrate O2 from the atmosphere? I’m leaning toward a theory of mass suffocation aboard Flight 370 due to lack of O2 in the cabin, a la the Payne Stewart Lear Jet tragedy from a few years back. Why the plane should veer off-course or the interior sensors not clue the pilots to immediately set down, I can’t say, of course. But IF there was a low O2 event happening, and the pilots tried to head for a nearby landing, but then passed out prior to suffocation, this could explain a lot. What are they smoking at MJ? How long before the governor of Washington state declares that climate change caused the deadly mudslide near Oso? Having “cut my teeth” geologically in New Zealand – you get used to see “slumps” commonly in certain landscapes there. From photos I have seen Oso looks to me like a stock standard slump. I would expect to see signs of earlier slumping in that landscape if you looked. So according the tha alarmists, CO2 can do ANYTHING as long as it’s a bad thing and good things, like helping plants grow is just not possible? A 777 pilot on a radio show (I wish I could remember which since ALL the talk shows put clueless “experts” on to fill air time) said the 777 flight system had a computer update in a recent technical service bulletin to correct the hacking problem. They didn’t call it a hacking problem though. I wasn’t aware the unauthorized updates could happen through the satellite feed though. I thought it was a wireless problem inside the aircraft. To me, having the possibility of the OFP being updated when the weight on wheels switch is in the false condition is a stupid feature. The software should be untouchable except on the ground, and safety equipment settings should be hard wired on a passenger aircraft. I still lean toward a pilot intentionally doing it, but I can’t figure out a motive since no statement was found and no group has claimed responsibility. The Oso mudslide is not the first in this area, just the largest and most people affected. I am keenly aware of this particular event since my mom’s youngest brother (my uncle) picked a bad time to be a good Samaritan at a friend’s house that was right in the center of that slide. We still have not heard of his fate. We are still hoping and praying he will be found alive, but time is not our friend on this. We hope for the best for him and all the missing, injured and dead. Earlier on Monday spotters on a Chinese plane said they had seen two white, square-shaped objects in the southern Indian Ocean, at that stage the second possible sighting of plane debris made with the naked eye in the search for the missing Malaysia Airlines Boeing 777. Spotters aboard that search plane reported the coordinates to a Chinese icebreaker ship, Xue Long, which was making its way to the area – as well as to the central Australian command centre. Some of you may remember the Icebreaker Xue Long, which was responsible for the rescue of a group of wayward tourists in Antarctica a couple of months ago. Better ocean info… Indian ocean. FOX News just announced that the only favorable factor so far has been the ocean currents. LOL. > I just read that “climate change will increase kidney stones” article. You are quite right. Nothing, absolutely NO THING will top that one. It’s actually plausible – more heat, sweating, and dehydration. Anyone taking bets on how long it will be before the Washington mudslide is blamed on global warming by the ecochondriacs? Next, Mother Jones will claim the disappearance of Santa Claus is due to Global Warming. That jet was not rendered electronically invisible just to fly it into the sea. Until aircraft wreckage is found, the wary among us should consider it parked in an Iranian or (insert terrorist nation name here) hangar being packed with C4. Target: some impressive example of western decadence. Preferably architectural. The RAAF dropped floating bouys where the original satellite pinpoint debris. These can plot the ocean currents as they are strong and they move very quickly. They spotted debris too further north, but the weather is too inclement for the search to continue as it would endanger the air crews. I don’t think a hijacker would bother planting false evidence out there. Possibly the pilots under threat, took the plane up above its ceiling on purpose. Those oxygen bottles only contain 12 minutes of air for the passengers, so I heard on air crash investigations on TV (I’ll never fly again, I will tell you) But my ex an ex military reconnaisance pilot and then commercial pilot told me most crashes are contributed to pilot error or air traffic control plotting mistakes. When will it be then possible for the large American ship to find the black boxes in 6,000 feet or is it metres of water. I saw an American air ace on TV, and he said it wasn’t just the transponder turned off it was other location beacons that required more knowledge of the workings of the plane’s computer system. But why disable these? It’s obvious whomever did this did not know Rolls Royce could still track them. Terrible for the relatives who hung on hoping they could have survived. There should be a way to create a betting pool for how long it will take someone to blame a tragedy on climate change or global warming. I’m watching the coverage on the mudslides in Washington State and I’m betting 48 hours! 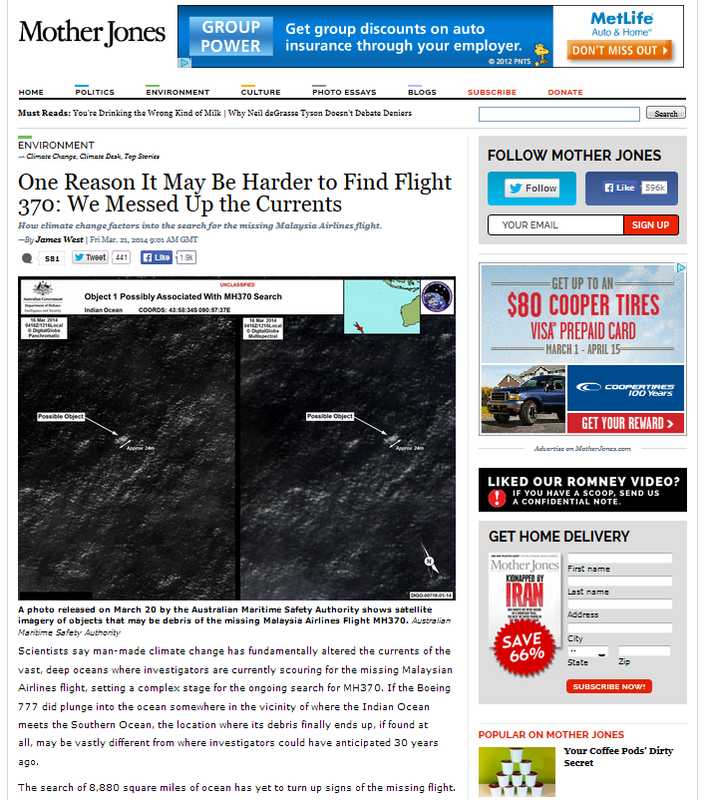 Mother Jones clearly has inside info on the fate of the Malaysian airliner. She’s probably been talking to Davy. apparently after 911 they put a system for remote operation into all the planes except lufthansa I think it was?they didnt install. there IS a name/acronym for it but it escapes me. knowing that makes all the rest of the see it here see it there fluff sound rather lame. Col Mosby had the most insightful analysis of the il-logic of this argument, but we all knew it was coming. Entertaining to read the comments though. Honestly, why do you read Mother Jones. They aren’t worth a click or a mention.